With our ear plugs in, once our heads hit the pillow we were out. We both slept soundly. So much in fact that when we woke up at 6:30 and popped our heads out of the tent we were surprised that 2/3 of our little tent village were gone. Breakfast wasn’t until 8:30am so we took our time packing up, trying to avoid carrying copious amounts of sand with us in our packs. After all of our chatting, charging and uploading it was 11 am. Waldo waited for us and we finally walked away from the hiker A-frame at 11:20. Big Lake Youth Camp and their staff are wonderful. We can’t thank them enough! After checking our maps we chose to walk along the dirt road rather than retrace our steps to the trail. We were passed by 2 trucks, one of which was a Fed Ex delivery truck. The driver slowed to say hello and to wish us well in our journey. 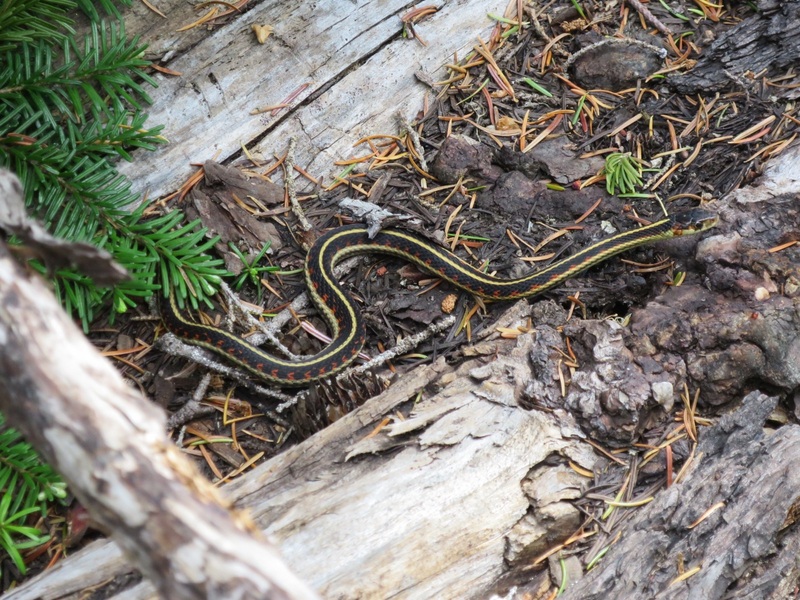 He had hiked the PCT in the 90s. 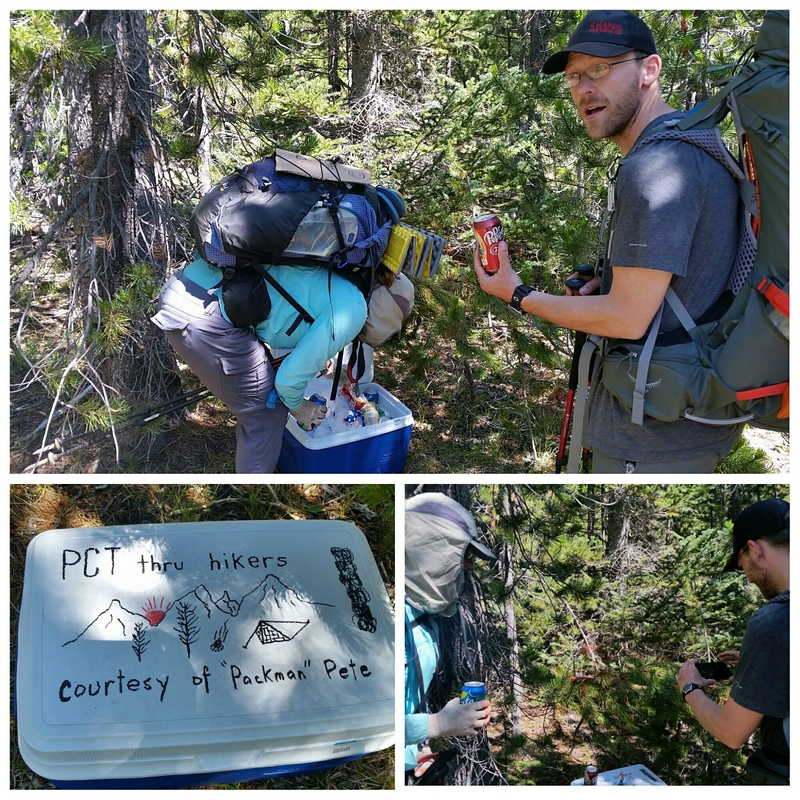 We re-joined the PCT 1.5 miles later and within 5 minutes stumbled along trail magic! Ten feet from the trail was a nicely decorated cooler with soda and beer. We had just eaten a big breakfast full of sugar but Laurie couldn’t resist trail magic. She and Waldo enjoyed a soda while Andy quietly substained. After 1500 miles soda still doesn’t appeal to him. 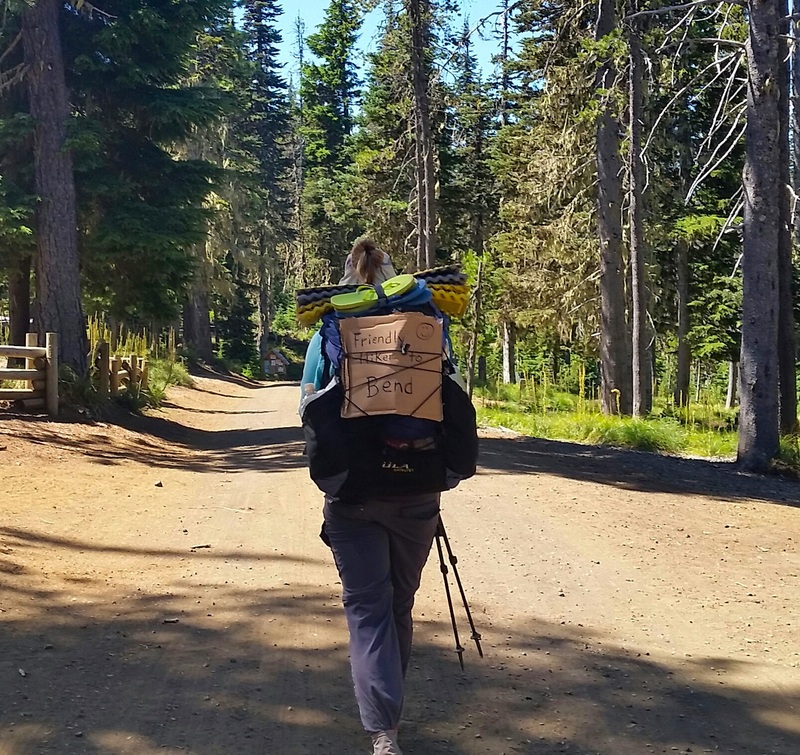 We walked another 4 miles to Hwy 20 and Santiam Pass. The trail sliced through an old burn area. 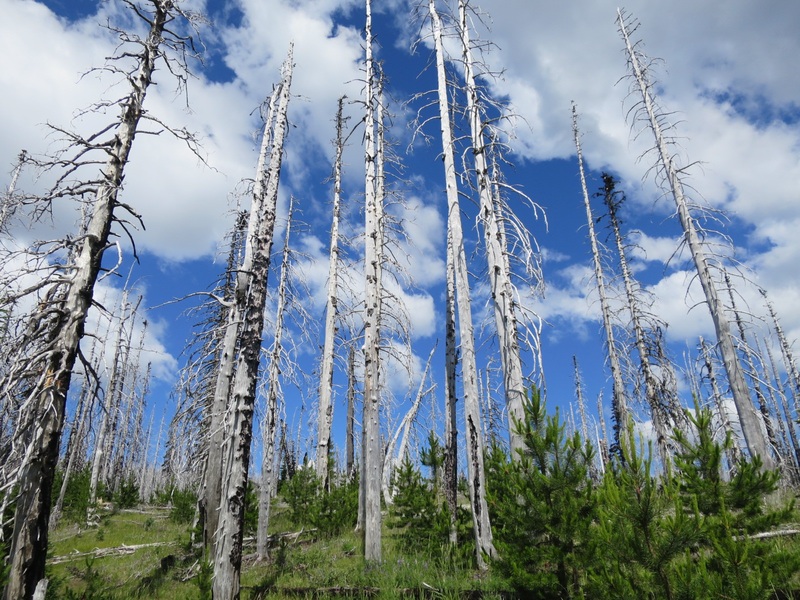 The vibrant green new growth provided a nice contrast to the burnt and dead old growth. It reminded us both of the intertwined nature of the cycle of life. We got to Santiam Pass around 1:15pm. Waldo needed to go back to Bend to get different shoes and we were continuing on. The question was how far. We said goodbye and watched Waldo walk down the highway holding his sign in search for a pullout and a friendly motorist. We walked another 15 minutes and took a break in the shade. Neither of us were feeling particularly motivated today. We had just lost the last member of our latest trail family and it felt like a loss, especially for Laurie. It still amazes us how quickly we can fall into a rhythm with strangers. And how these strangers become great friends over the span of a few days. Laurie gets attached easily and this is apparent everytime we have to say goodbye. She fantasises about future adventures together but understands the strong likelihood that we may never see one another again. This trail is one of the first times we have made friends as a couple. Majority of our friends at home were friends with one of us initially. It feels nice to be creating new relationships as a unit. 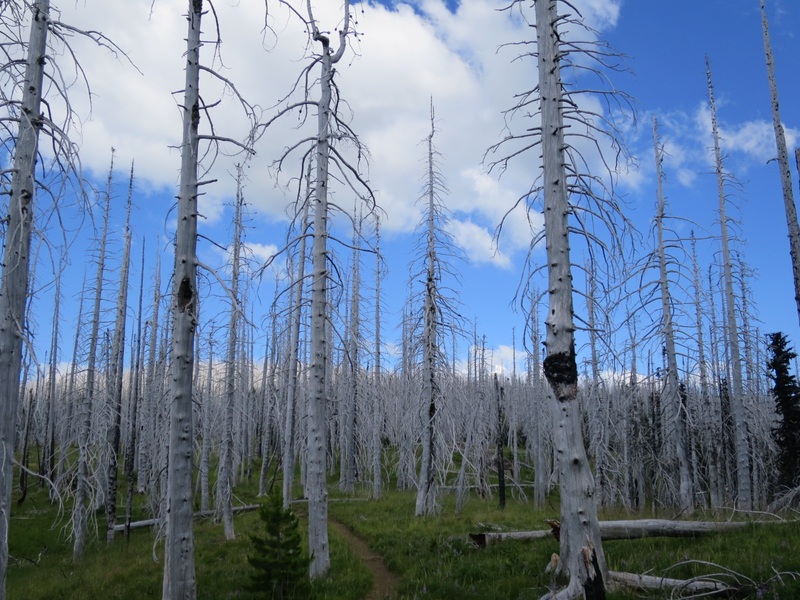 We walked through yet another burn area. The sun was intense initially but as we climbed the number of clouds in the sky increased. There was a nice breeze and the hiking was comfortable – particularly when the sun hid behind a cloud. The burn area was HUGE! 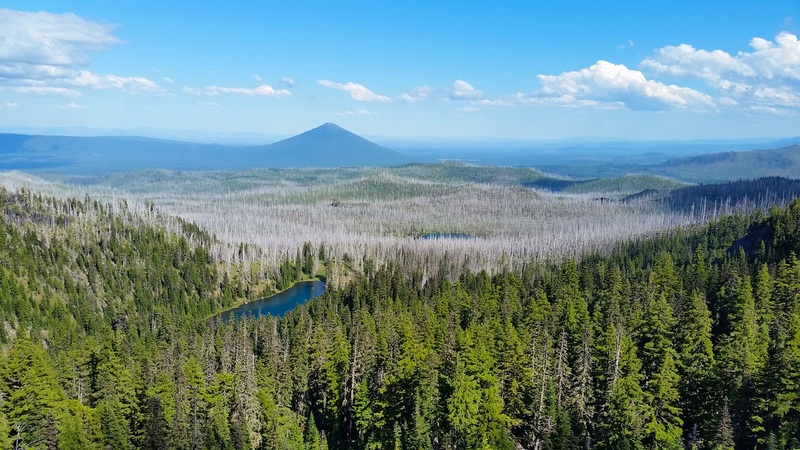 Once on a ridge below Three Fingered Jack we could see far and wide and truly appreciate the immensity of this fire. 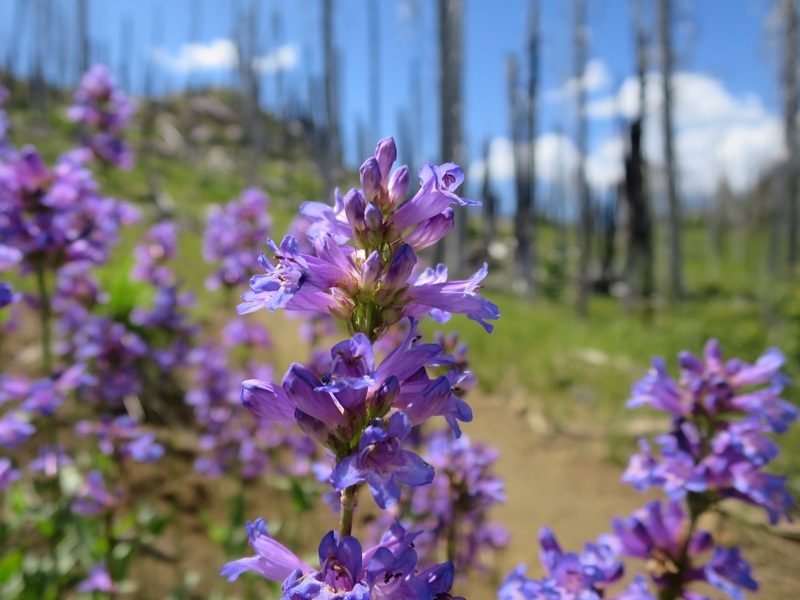 We walked alongside penstemon and lupine below the bare and scorched trees. A third of the way into our climb we stopped for a snack on a rock. Within 5 minutes our feet were bitten my small and fast mosquitoes. We swatted at the mozzies while we ate a bag of trail mix and apples. We had planned to hike another 7 miles past the next water source to a campsite. The pace we were traveling we would get to camp around 7:15pm. We walked on, past an awesome tentsite on the edge of some rocks overlooking the valley. We wished we had enough water to camp here but since we didn’t we reluctantly walked on. 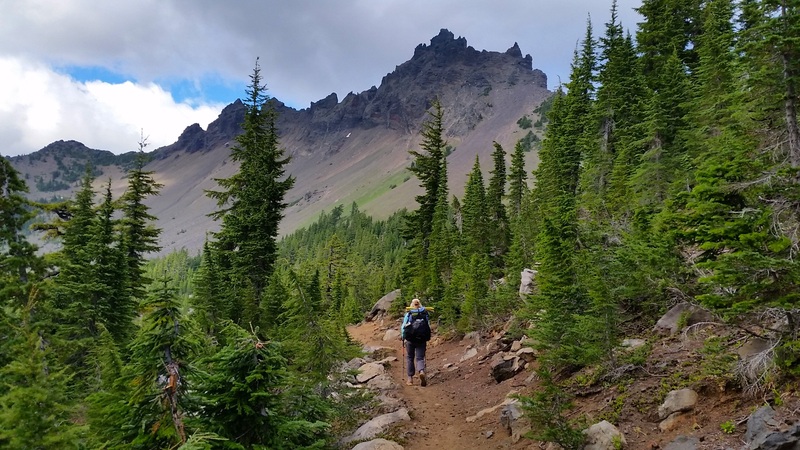 About a mile later the trail opened up and we walked along the scree at the base of Three Fingered Jack. Laurie spotted at least 5 mountain goats traversing the mountain. We noticed a narrow use trail off to the left which lead to 2 tentsites. We looked at each other. “We can make it work” reassured Laurie holding up her liter of water. “Yeah. We won’t cook dinner” Andy replied. This spot was too nice to pass up. We didn’t feel like pushing today and this way hopefully Waldo can continue to hike with us. Andy texted him and let him know where we were in case he could make it. It was 5 pm and we were home for the night. We set up our tent and crawled in to escape the mosquitoes. We felt grateful for the sun but it got hot sitting in the tent. There were too many mozzies to sit outside on the rocks so we stayed inside crammed at the foot end for more protection from the sun. We snacked on bars and nuts until we could eat no more. Around 8:45 Andy thought he heard a whistle. He whistled back. He whistled again. Nothing. “In the clouds” replied Waldo from the junction. Waldo had the hitching adventure of his life and still made it to camp before dark. We were both happy to see him. Eventually we will have to separate because of different schedules and logistics but today was not that day. We are grateful for at least one more night together. 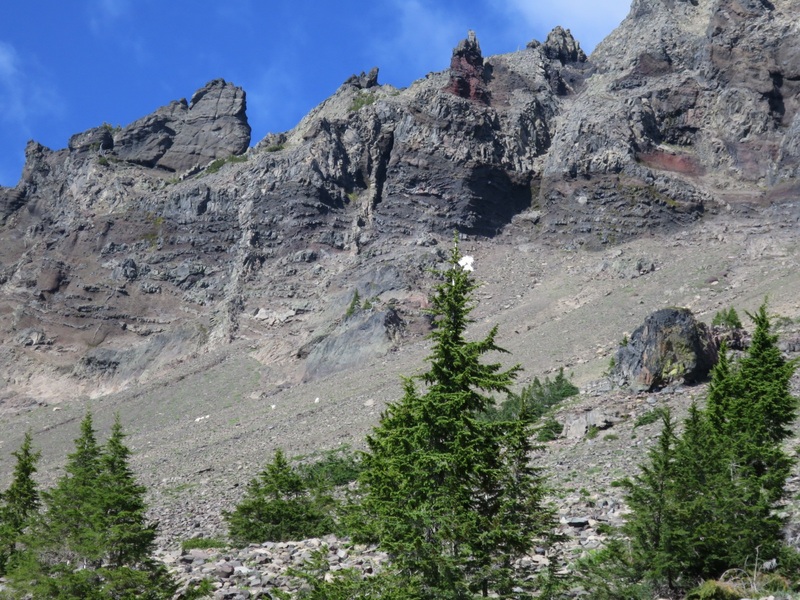 When we got to our campsite we had an amazing view of Three Fingered Jack and the valley below. Around 7 pm the clouds rolled in and by 9 we were socked in completely. We could hear occasional rocks falling in the distance and could only see 30 ft in front of us. We are happy we stopped early and even happier to be in Waldo’s company tonight. Tonight we are grateful for the opportunity to live freely and stray away from rigid schedules and the generosity of Big Lake Youth Camp. How many mountain goats do you see?